This is that last alcohol review I anticipate for the next month or so. I’m not a heavy drinker and sampling 3 different alcoholic beverages in a span of 2 weeks is pushing my limits. Once again, I had to look up what exactly Amaro is. Apparently amaro is an Italian liqueur that is usually drunk after a meal to help with the digestion. Several amaro recipes actually date back to 19th century monasteries or pharmacies. This past weekend, my fellow testers and I sampled Averno Amaro. Dating back to 1868, when company founder Salvatore Averna got his secret recipe from Benedictine monks, Averno Amaro is made by soaking flowers, herbs, dried fruits, spices, licorice and caramel in alcohol. The result is a powerful drink (64 proof) that has a distinct herbal after-taste. 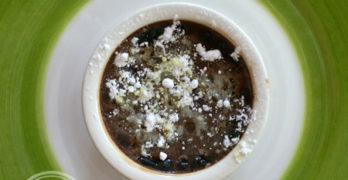 The licorice flavor is also very strong, but it isn’t overwhelming. Averno Amaro isn’t like other strong liquors, so I had to sip it a few times to get my mind used to the new flavor. 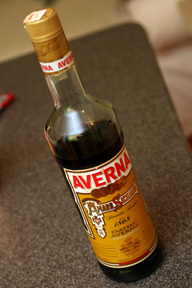 Typically, Averno Amaro is served neat or over ice. After trying it neat, I opted to turn it into a cocktail by adding some Sprite and ice to lighten the flavor. The result was a very smooth drink that wasn’t too strong. Whether or not it actually aided in my digestion of pizza is up for debate, but it certainly did provide a new and unique flavor that was a fun and tasty to sip on while I finished watching Indiana Jones. Speaking from the perspective of one of the taste testers, I can say that “flowers, herbs, dried fruits, spices, licorice and caramel in alcohol” is the perfect description of what goes on inside the mouth when you try this product. I am not much for Alcohol but i like that this Liqueur has herbs and dried fruit in the ingredients. And it also helps with digestion? Wow, that alone makes this alcoholic drink very appealing and healthy for you. Thanks for sharing.